Inability to kill catalase positive organisms like staphylococcus and aspergillus. Early manifestations: Miliary nodules, abscess, pneumonia, empyema. Late manifestations: bronchiectasis and pulmonary fibrosis. Leukocyte adhesion deficiency type I.
Presents in infants as bacterial infection. May present with infections similar that of CGD. Haemolytic anaemia on consumption of fava beans or medications. Typically occurs in patients with diabetes. Most common infection is Candida. Paediatric chest x-ray showing cardiomegaly. The most common primary cardiac tumour in children. It is associated with the ventricular myocardium and appears homogeneously hyperintense on T2-weighted images. 50 to 70% are associated with tuberous sclerosis. LAM (lymphangioleiomyomatosis): Uniform sized cysts. Early: Nodules with small cysts. Spontaenous pneumothorax. Advanced: Large cysts with pulmonary fibrosis. Can involve bones as well. 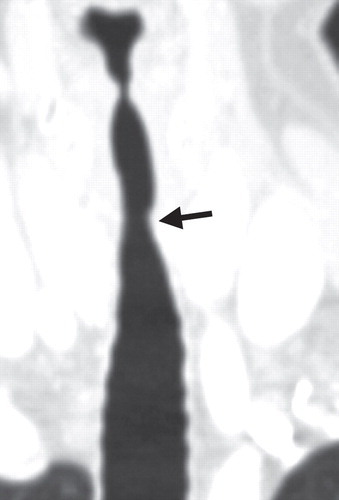 Trachea: Subglottic stenosis. 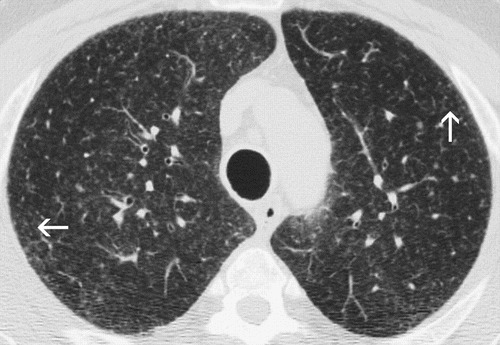 Image from RSNA article: Wegners uncommon and common manifestations.